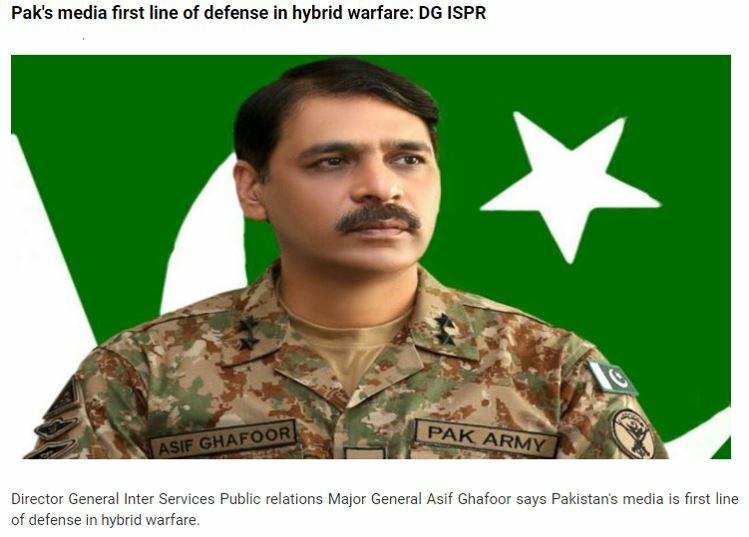 The Inter-Services Public Relations ISPR is the media wing, “the mouthpiece” of the Pakistan Armed Forces which is supposed to broadcast and coordinate military news and information to the country’s civilian media and the civil society. Keeping the public informed of the activities of defence services, their scope, and importance, within parameters of security. Forestall leakage of any damaging information to the news media. Provide war correspondents in times of war. To maintain close liaison with official/ private news media and government information agencies for exchange of information. Arrange visits of media representatives to exercises, demonstrations, parades, and theatres of operations. Highlight nation-building activities of armed forces. However, over the years various instances indicate that the role of ISPR has gone far beyond its domain. DG ISPR recently stated, Media has now become “Pak Army’s First Line of Defence”. By this statement, he tactfully conveyed that, Pak media is a “Force Multiplier.” However, not many could decipher what the “5G Warrior” actually wanted to convey. Majority fell for his bait, only very few were able to grasp his cryptic message. His statement very covertly implies, that now since We have declared Media as the First Line of Defence, by default, We ~ ISPR ~ Military become “in charge of it” although, in “Incognito mode.” Effectively he has done his job. And its Huge!! 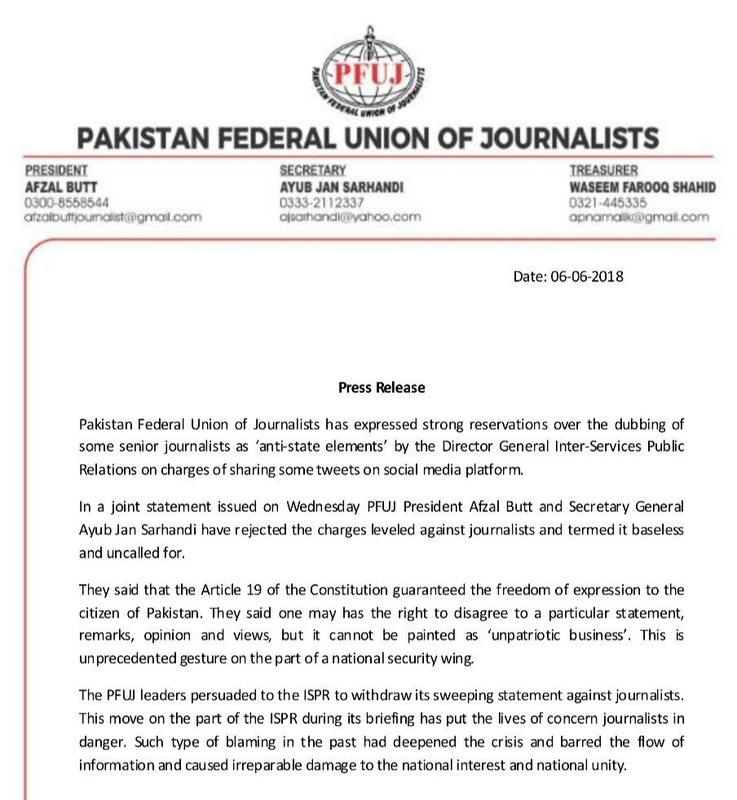 Not only has he empowered himself – DG ISPR, he has also advocated for the strong army which has umpteen accusations levelled by the local and international journo community for “Media seize in Pakistan“. It goes without saying that to establish such a monopoly, ISPR has been given a free run by the top brass. It is seen that on the same day, DG ISPR held two separate interactions with the local and Pakistan based foreign media respectively. But why two separate meetings for the same set of people ~ “journalists”? Although tagged as a traitor by many, the tweet below, by this fellow Pakistani journo cannot be overruled completely. 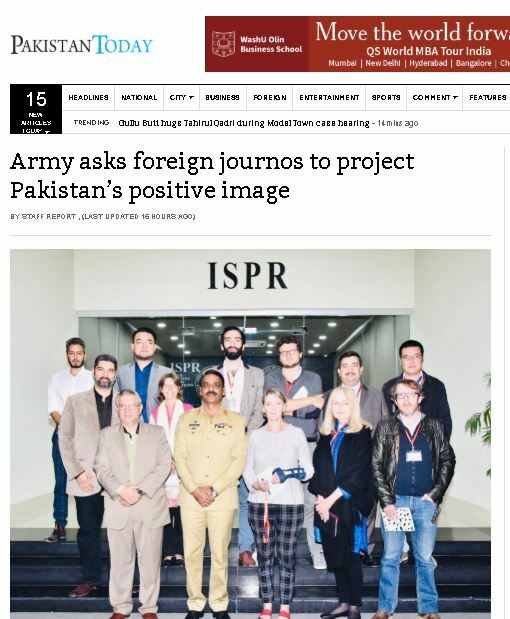 Ironically, Gen Gafoor also urged the foreign journalists to report positively about military and Pakistan, which would help improve the image of Pakistan globally. 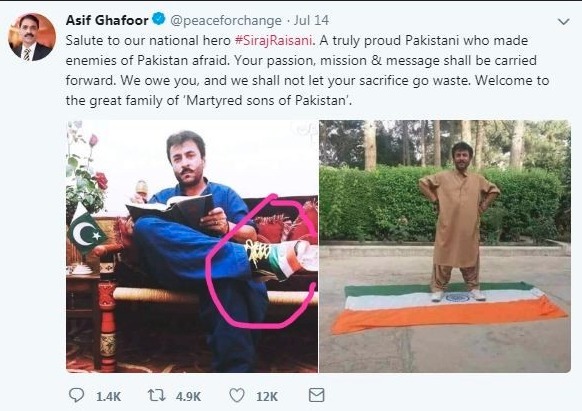 This is again viewed as a very immature act, rather an act of desperation from a very high ranking army officer – the spokesperson of the Pak Army. Well, this is not his first. DG ISPR has regularly been criticized for posting inflammatory tweets on official and his personal Twitter account. Not very long ago he posted a picture insulting the national flag of a neighboring country. Such an act by an officer who is at the helm of ISPR, reflects very poorly of his military ethos. In April 2017, Maj Gen Asif Ghafoor posted a tweet ‘rejecting’ Prime Minister’s directives to probe Dawn Leaks controversy. After huge public outcry over the choice of words, ISPR had to redact its earlier tweet. Similarly, during Allama Khadim Rizvi’s Islamabad sit-in a tweet was posted attributing COAS’s appeal to ‘both sides’ to exercise restraint. This was widely decried for equating people’s elected government against a mob, further strengthening the belief that Army was behind the sit-ins to the arm-twist government. Recently a non-bailable arrest warrant was issued against Cyril Almedia. He was also placed on the Exit Control List, and charged with treason for publishing an interview of the former prime minister Nawaz Sharif, where Sharif is reported to have said, in connection with the trial of the accused in the 2008 Mumbai attacks. 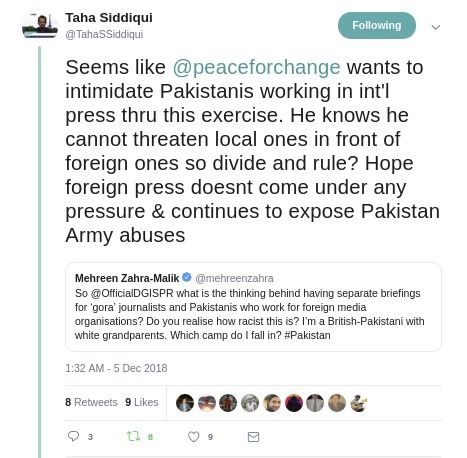 Taha Siddiqui a well-known journalist whose work has appeared in the New York Times, the Guardian and won the Albert Londres Prix award, the French equivalent of the Pulitzer Prize, too faced the ire of the military. In his own country, he is known for critical comments on social media about the powerful military. For the same, he has faced life-threatening consequences. While Mr. Siddiqui has dodged death and remains physically unhurt, others have not been as lucky. Last year an Islamabad-based reporter of the Jang group of newspapers, Ahmad Noorani, was severely beaten by six men wielding iron knuckles, chains, and knives. His investigations into the recent Panama Papers case hearings unearthed embarrassing revelations about the role of the military that led to what some saw as the “forced” disqualification of then Prime Minister Nawaz Sharif. Waqass Goraya, a liberal Pakistani activist who went missing in 2017 said a “government institution” with links to the military held him and tortured him. Mr. Goraya believes he was detained because he ran a satirical Facebook page critical of the influence of the Pakistani military in the country’s political system. The page had also criticised military policy in Pakistan’s restive Balochistan province. 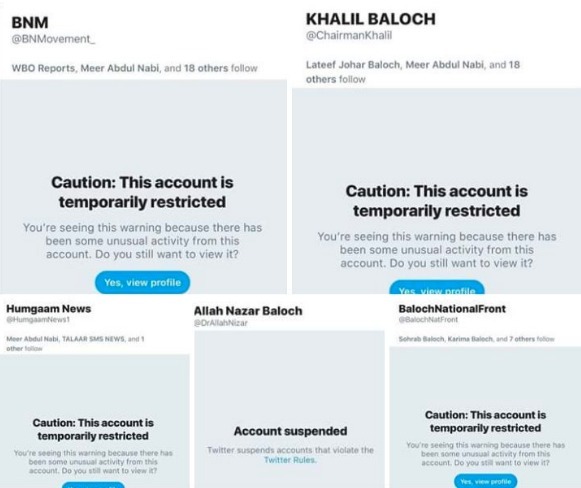 The recent suspension of Twitter handles, of critics of the Pak military, further reflects the strong control which the military wants to exert on the freedom of these journos. Reports are based on events, facts, and int available to journalists. They will write what they observe and gather. They should not be expected to tow the line of the military. Pakistan’s media for long has been globally acknowledged for bold, transparent and vibrant journalism. However, in recent years it clearly appears to have been squeezed by the state and non-state actors. Amnesty International highlights journalists across Pakistan live with the daily threat of harassment, abductions, torture or killings. Those covering sensitive national security and human rights issues are particularly at risk from the intelligence agencies, political parties, and armed groups like the Taliban. The conflicting professional requirements of media and military can lead to a misunderstanding of each other’s working environment, however, by no means can military subjugate media. This clearly implies undermining democracy. Crossing the mandate in the greed of power will cost heavily in times to come, till then the likes of Taha, Hamid, Gul, Shahista, Noorani, Saeeda, Haider, Goaraya etc. will continue paying the price.